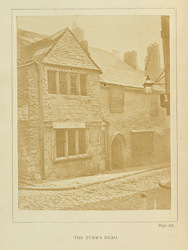 "There was...in Andrew Street, on the site now occupied by the Abbey Wine Vaults, an ancient hostelry known as the Turk's Head, and reputed to be the oldest house in Plymouth. Not improbably it dated from the fourteenth century, and within its walls must the worthies of old Plymouth have quaffed many a flagon of sack." This mediaeval building was demolished in 1861.